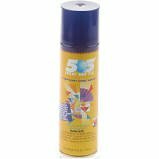 505 Spray and Fix fabric adhesive eliminates basting and pinning. Use for machine applique, quilting and embroidery. Will not leave your fabric, working surface or hands sticky when used properly. Acid free, environmentally friendly.